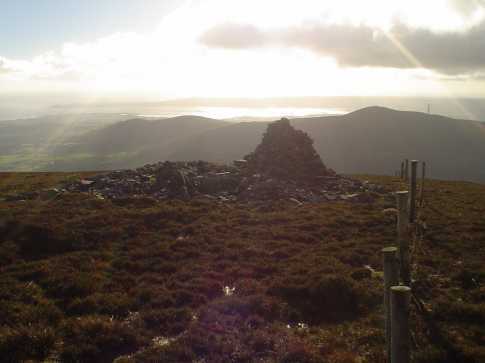 The summit cairn of Farbreaga (point 593mtrs on OS maps)looking south over Dungarvan bay. The old sheep wire fence on the right has seen better days - it certainly wouldn't present any obstacle to a semi-determined sheep.Directly in front of where the fence disappears from view over the side of the mountain you can see Crohaun hill with a TV mast on its western flank. For some reason the Comeraghs/Monavullaghs seem to be plagued with both redundant and active transmitters - wouldn't it be great if those who put them up came back and took them down when they are no longer in use?